The design of the Russak Dermatology Clinic distances patients from the institutional and sterile preconceptions of typical healthcare spaces. This departure was achieved by splitting the space into two distinct and contrasting experiences: the clinical space and the social space, or “living room”. 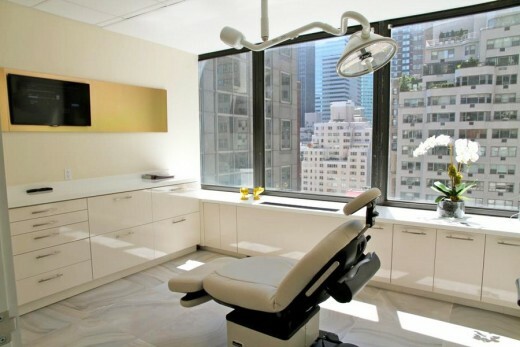 The clinical space is a hygienic and professional environment, made with primarily white materials. This creates a tone for the room that invites a feeling of serenity for each patient. Immediately visible from the reception is a continuous gold band, which forms the logo and continues unbroken through a seamless reflective hallway. The reception desk begins as a highly decorative, but traditional form and morphs along its length to become clean and modern. The juxtaposition of the two time periods creates a stunning conversation piece. This piece also unifies the two spaces. 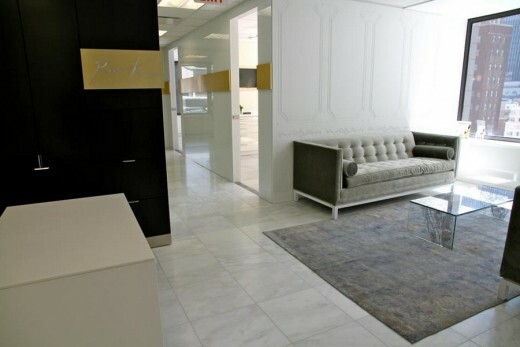 The social space is designed to emulate a luxurious and sophisticated Parisian living room. 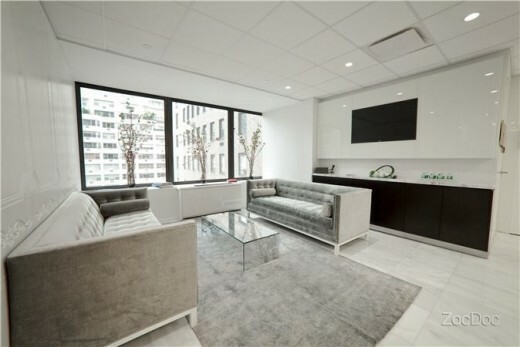 It is a space for meeting, relaxing, and comfort. Inspired by Russak’s timeless approach to skin treatment, the design strives to take the traditional Parisian living room aesthetic and reinterpret it into a new waiting room paradigm; a “living room” area. This is done through the use of new technologies to enhance the waiting experience. 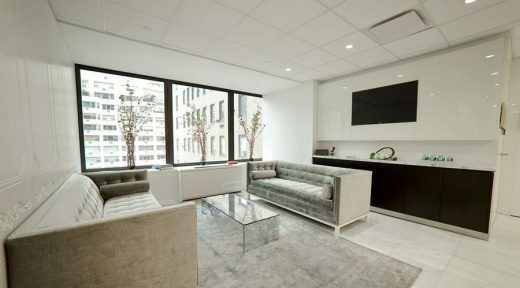 The hand crafted reception desk, bespoke Corian wall paneling, custom-made crystal rainfall chandelier, butterflied marble stone, and Manhattan reflection coffee table are just a few of the key pieces that help bring the living room to life. 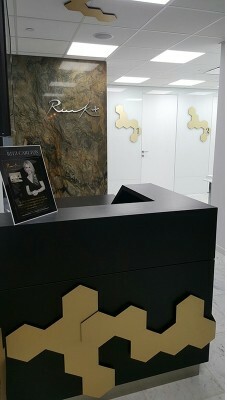 The new aesthetic addition to Russak Dermatology Clinic, Russak+, exudes luxury and promotes the fusion of science and fashion. The original premise of spatial and functional duality extends further into the DNA of this project, fusing timeless design and functionality with the “decorative molecule” concept. 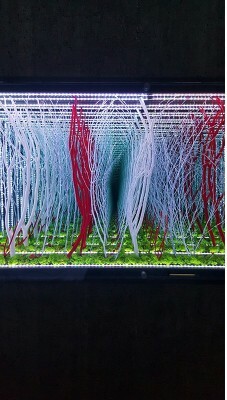 The idea was inspired by a hexagonal molecular geometry pattern, arranged in an abstract, organic composition. This pattern has evolved into a jeweled masterpiece growing over the entire space in the form of ornamental wall features and a wayfinding strategy. 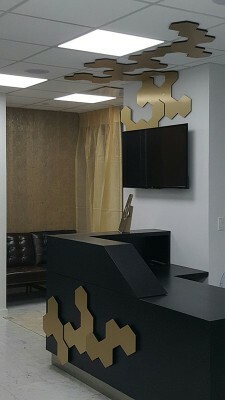 The reception desk is custom-made black oak and is wrapped in a brass-finished hexagonal feature, with a moss wall, gold sheers, and exotic Brazilian quartzite stone behind it. 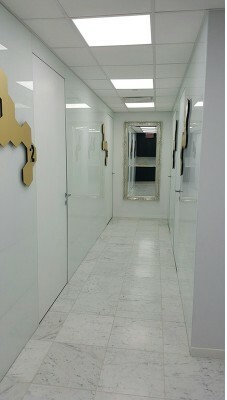 The treatment rooms on either side of the corridor are clad in white glass, contrasting with the reception area. The room doors are flush to the wall in order to create a seamless backdrop for the wall features. 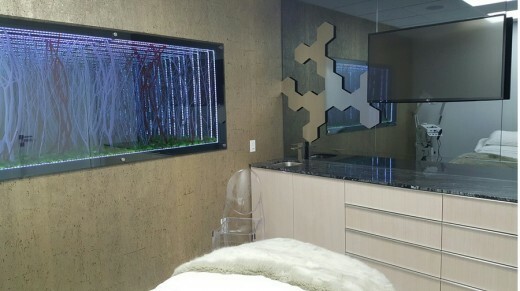 The journey through this sanctuary continues inside the treatment rooms, each equipped with a themed infinity box over cork wall covering, to add warmth and depth, and custom-made millwork in a white hand scraped oak finish. Russak+ has achieved a strong dynamic between the sophisticated aesthetic and pure functionality by utilizing a mix of luxurious materials, rich textures, and seamless, contemporary detailing.